Possibly the most decorative atlas map of the world to appear in the 19th century. A visually stunning decorative map of the world dating to 1852, by French map publisher Victor Levasseur. 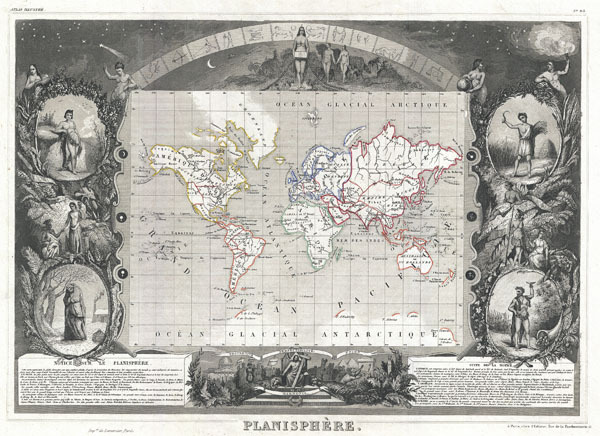 Levasseur depicts the world on a Mercator Projection, showing the six known continents as well as traces of Antarctica. The cartographic style of this piece is minimalist, but a few elements do bear special note. These include the extension of Oregon territory well into British Columbia, reflecting the American claims that later led to the 54 40' dispute. Also in North America, Texas is identified as an independent nation. Far to the north both the Northwest Passage over America and the Northeast Passage over Europe and Asia, are drawn as open and practically navigable waterways. By far this map's most striking feature is its elaborate allegorical border work. Levasseur composed this map for publication in his magnificent Atlas Nacionale de la France Illustree, one of the most decorative and beautifully produced atlases to appear in the 19th century. This particular map is surrounded by four medallions bearing allegorical representation of each season. Spring, in the upper left, is represented by a young unclothed woman modestly covering herself with garlands. Summer, in the lower right, is a powerful bearded man wearing an animal skin and surrounded by the bounty of life. Fall, upper right, is a young man reaping the harvest. And winter, lower left, is a huddled old woman in a barren snow covered setting. Atop the map is an image of the firmament, with shooting starts, clouds, and a symbolic representation of the Zodiac. At center is a curious unclothed women with four breasts who appears to be chained to the earth or to a heavy box which she is holding - Pandora? Adam and Eve appear to her right walking hand in hand through pre-fall Eden. There too is the serpent, slithering just behind the couple. At the base of the map an even more interesting scene unfolds in the form of a curious panorama. Here Jesus sits enthroned, bearing a cross in his left hand and pointing with his right, his head surrounded by a pyramid (a Masonic reference?). To his left are a stoic crowd including Napoleon, Socrates, and other unidentifiable great men bearing signs reading 'Paix' (peace), 'Liber' (freedom), and 'Egalite' (equality). Behind them is a domed building that appears to be a Greek or Roman temple. Opposite this scene, on Jesus' right is a very different scene showing a crowd fleeing in terror - these include a Pharisee holding the Torah and a turbaned Saracen. Behind them are the pyramids of Egypt. They are running towards what appears to be the jungle in the midst of which is a plinth upon which sets a bust of Satan. In this we can only assume that Levasseur is attempting to convey the righteousness of reason and logic over emotion and old world superstition. Publised by V. Levasseur as page no. 95 in the 1852 edition of his Atlas National de la France Illustree.